A popular illustrated guide to wild flowers published in the 1950s described this species as "evil-looking and evil-smelling", but in fact its flowers are by no means unattractive in appearance. 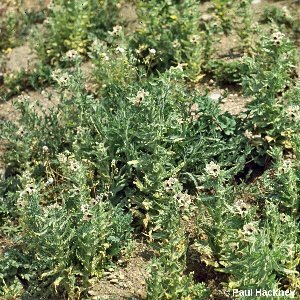 It is a rather local and rare species of disturbed ground, mainly near the sea. One of its best-known sites is at Benderg Bay in Co. Down where it grows on sandy sea-cliffs subject to slippage. It periodically disappears from the site but disturbance of the ground produces a flush of new plants from buried dormant seed. 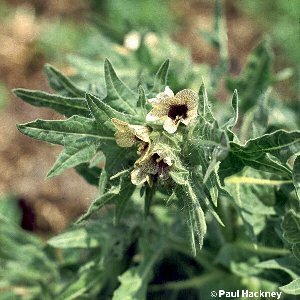 It is a biennial plant, very hairy and grows up to about three or four feet in height. 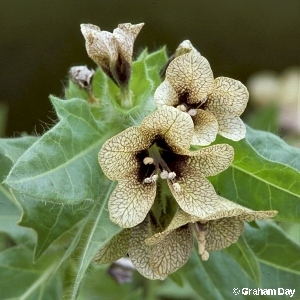 Like many of this family, henbane is poisonous. The poisonous agents are alkaloids, which have pharmacological uses when administered in controlled doses under proper medical conditions. All names: Hyoscyamus niger L.